Highly aggressive, this fish will not tolerate other fish of the same species in a tank smaller than 75g. This fish is NOT recommended for beginners due to its aggressive nature. 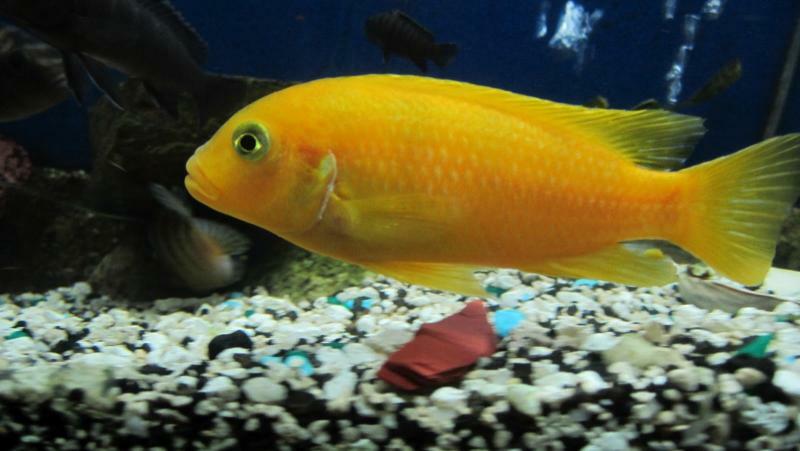 In the home aquarium, a good quality cichlid formula of either flakes or pellets, supplement this with vegetables at least once a week, these can include de-shelled peas, carrots (not raw, soften them first) and zucchini. This fish is extremely aggressive to other fish of the same genus and will be very aggressive to other fish in a smaller tank, as such these fish should ideally be housed in a 125g or larger aquarium with lots of rocky hiding spots. Being a maternal mouthbrooder, females will hold for about 20-28 days before spitting free swimming fry out. 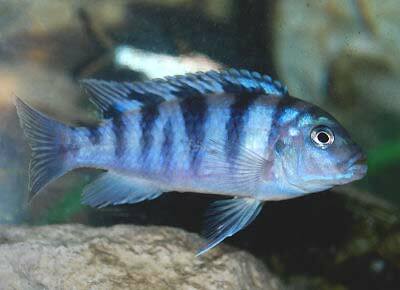 This fish is NOT for beginners into cichlids at all, it can kill and entire tank and cause anarchy very quickly if not housed in the correct tank with the correct tank mates. Many people mistakenly purchase this fish in stores as juveniles, juveniles are blue and white with black vertical barring. Upon reaching adulthood Males turn a dark orange color and females remain blue. 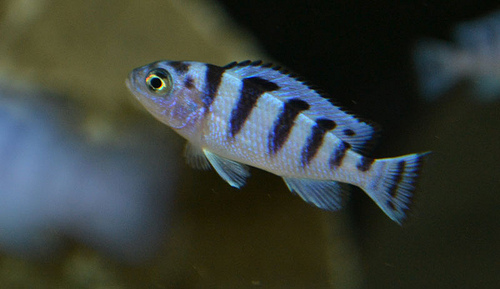 Holding females display a characteristic not seen in many other cichlids, being so aggressive to other fish, females will change color to almost identical coloration to males, scientist do not know why this occurs and males will not be overly aggressive to holding females. Fry batches usually consist of between 16-22 fry. Warning these fish are sometimes described incorrectly in fish stores as Metriclima Esterae, or Red Zebra. Red Zebra are a more Orange color compared to these fish. Pictured are an Adult male, Young female and juvenile (note the similar color of the female and juvenile).